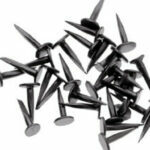 These ‘Fine‘ Blued Cut Tacks are used for attaching fabric. These upholstery tacks are from an original batch of high quality tacks from Crown Nails, these tacks are very sought after so get them while you can!! !